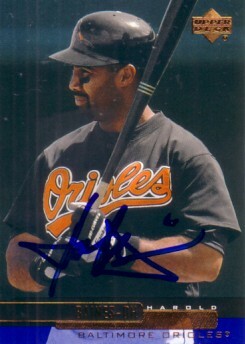 2000 Upper Deck Orioles card autographed in blue marker by former star Harold Baines, a Maryland native who spent the latter part of his stellar career in Baltimore. With certificate of authenticity from AutographsForSale.com. ONLY ONE AVAILABLE FOR SALE.